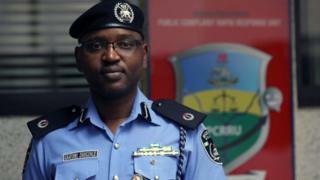 Yomi Shogunle, wey be di Head of Nigeria Police Complaints Response Unit, fit don discover di correct way for citizens and police to take live in peace: Pidgin. "For now, no go dey speak Queen's English wit dem for road. For proper understanding, tok to dem for Pidgin, anoda way to avoid kasala." For di video wia im dey comment, di RRS oga Tunji Disu dey follow im men tok wit both correct English and Pidgin. As you go expect, pipo for social media begin drag oga Shogunle for wetin im tok. Dis no be di first time wey oga Shogunle go tok wetin go make pipo drag am for social media. Infact sef for 2018, pipo for social media bin ask Twitter to ban im account. E neva tey wey Nigeria Police tok-tok pesin for Lagos State also enta hot water wit pipo, wen im say "tattoos and dreadlocks dey strange to our culture."